I was wrong. A few weeks ago I wrongly dissed groundnut (Apios americana) for invading my flower garden. Yes, I planted it; that was 30 years ago, and it’s resisted my attempts at eradication for the past 28 years. The worse culprit, this year at least, is related to groundnut. Like groundnut, it’s a legume, it’s native, it’s edible, and it’s a vining plant with compound leaves. But each leaf of hog peanut (Amphicarpaea bracteata), has 3 egg-shaped leaflets, as compared with groundnut’s 5 lance-shaped leaflets. Hog peanuts produce flowers both above ground and below ground. Below ground is where the goodies are. Pods that form there enclose peanut-sized seeds that allegedly are tasty raw or cooked. I’ll see if I can dig some up in a few weeks. Like groundnuts, hog peanuts provided food for Native Americans; the plants were among the four sacred plants of the Osage. So what can be bad about a plant that tolerates some shade, adds nitrogen to the soil, and yields an allegedly tasty seed below ground? 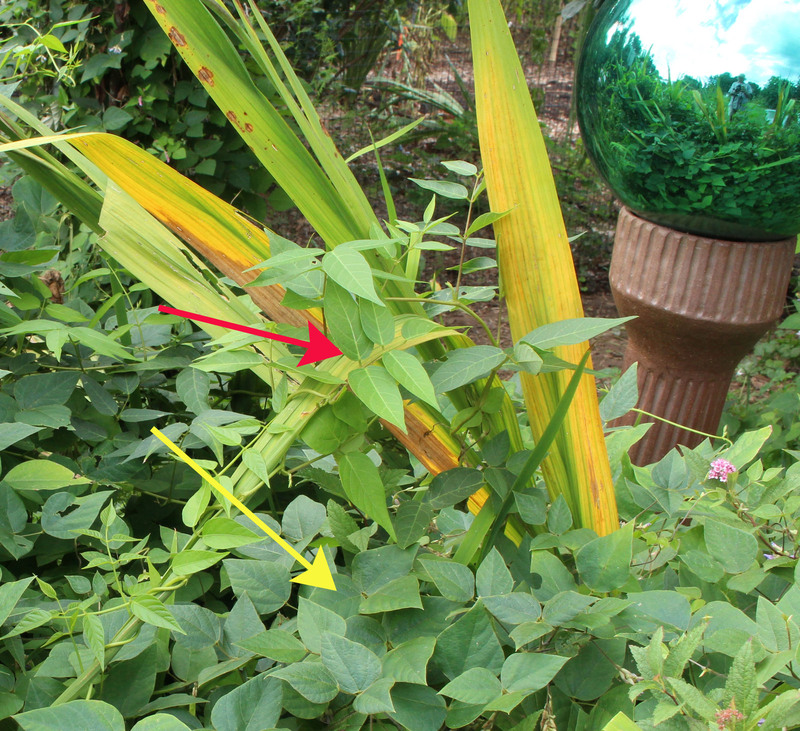 The problem is that it’s run wild over the flower bed, the fine stems and leaves attempting to smother, sometimes successfully, every plant in its path. Even non-native, invasive Japanese stilt grass and garlic mustard can’t hold their own against hog peanuts. Low maintenance, protection and enrichment of soil, and edible parts recommend hog peanut and groundnut to permies (permaculturalists). As with so much in permaculture, these plants perform better in theory than in practice. 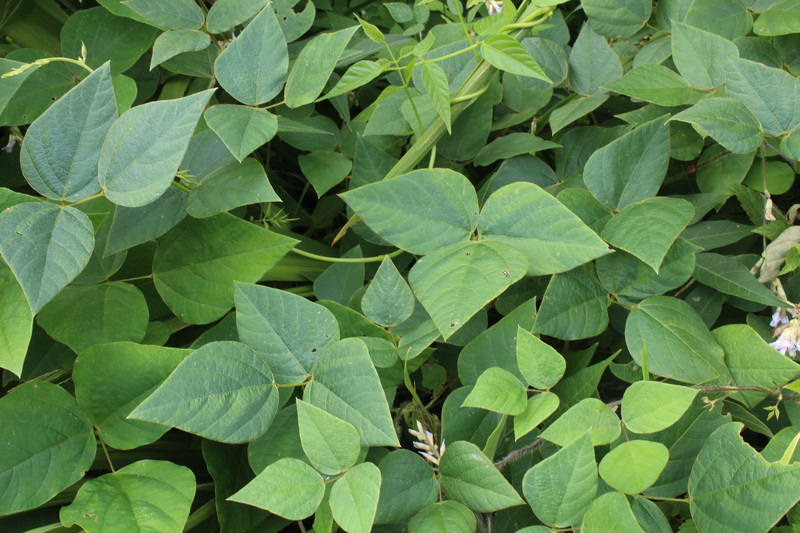 In humid climates, plant growth — and not just groundnut and hog peanut — can run rampant. Growth needs to be controlled and balanced, a job made more difficult in a permaculture “guild” of groups of plants working together. I’m all for interplanting different species to make best use of light, water, and soil resources, and form communities that resist pests — to a point. Not that I’m immune to such errors. A few years ago I created a very permaculturesque planting that included elderberries, seaberries, and rugose roses almost elbow to elbow. It all looks very nice but these three shrubs all spread by suckers. I keep everything in check with elbow grease and a scythe . . . for now, but Mother Nature is relentless. Am I? The most productive and accessible parts of the UMass garden are the beds of kale, beets, and other vegetables — straight rows in cultivated soil. How un-permaculturalesque. Oh, I forgot to mention the groundnuts at UMass. Stems of those plants are twining around and overpowering others in their guild in an ever-widening circle. Even if the groundnuts could peacefully coexist with their neighbors, grubbing up the golf ball size tubers will require an inordinate amount of time and soil discombobulation. My memory fails me. Perhaps it was hog peanut rather than groundnut vines threatening their neighbors. Perhaps it was both plants. Hog peanut has been suggested for erosion control, and as a groundcover, a livestock forage, and a food for humans. My suggestion: Hog food. Turn some hogs loose in a patch, and they’ll fatten as they clear the ground of this pernicious weed. Does anybody have a small hog for rent? 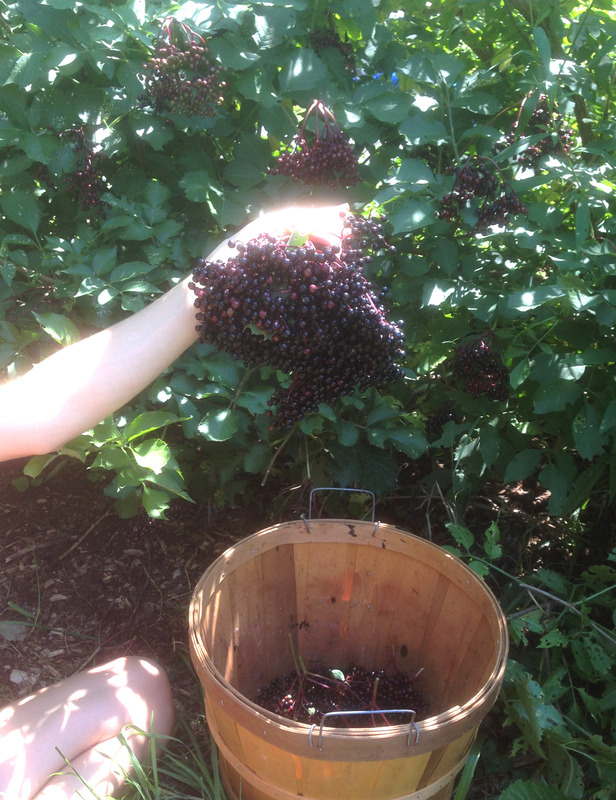 Elderberry looked to be one of the most successful plants in the UMass permaculture garden. It grows fast and it grows high. My two plants, now in their third year, yielded more than four gallons of berries. And harvest, last week, was quick and easy; aggressively tickling the umbels had the berries quickly filling a basket. Elderberries can also be recommended for their flowers and the berries’ deep, blue color. 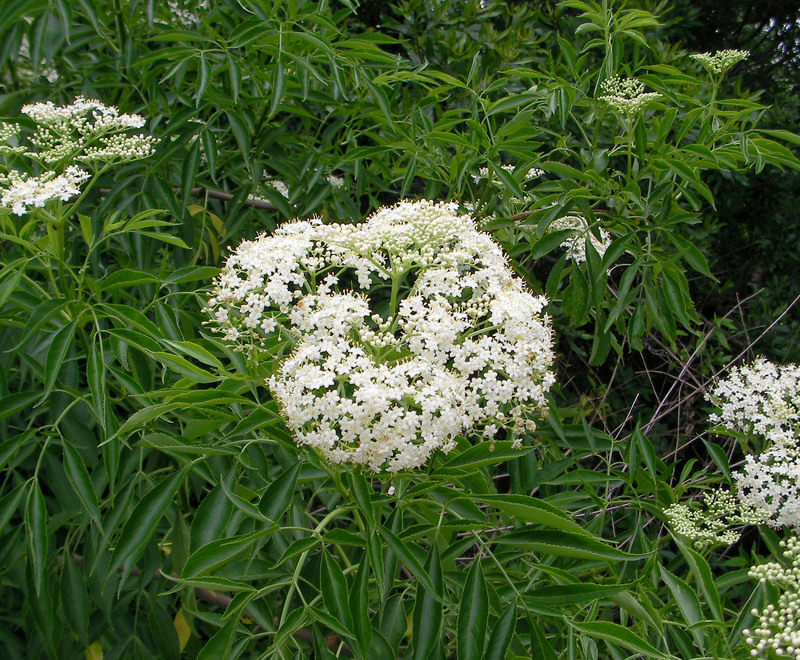 Flowers open in June to dinnerplate size umbels of small, white blossoms. They’re good for tea, fritters, or to flavor wine. The berries impart their good color, but little flavor, to wine, pie, and juice. (They should not be eaten uncooked or unripe.) There’s a bit of scientific evidence than an extract or syrup of the berries can help fight flu, perhaps other ailments also. I’m good at growing fruit, not cooking it, so I gave my crop to Dina Falconi who concocted a syrup using the recipe from her book Foraging & Feasting. I look forward to tasting the benefits of my horticultural and her culinary skills. This entry was posted in Design, Flowers, Fruit, Gardening, Planning, Vegetables and tagged Amphicarpaea, Apios, elderberry, groundnut, hog peanut, permaculture, Sambucus. Bookmark the permalink. Trackbacks are closed, but you can post a comment.